…like tonight, I faced a fridge full of CSA shareveggies, a boatload of eggs, and decided to make crepes filled with a simple saute of diced carrots, onions, green pepper, garlic, and mushrooms. With a tablespoon each of creme fraiche and minced fresh herbs* to finish, it really did make a light, lovely din. With a French white, on the deck, very nice. And – thank goodness – Not. Our. Usual! Don’t forget about crepes, they’re easy, delicious, and mix things up nicely. 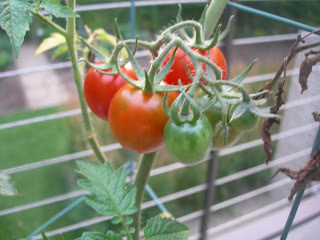 * My poor fresh herbs, in pots on my deck. 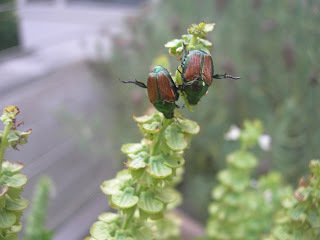 The parsley and dill are completely defoliated by black swallow-tail caterpillars, and the basil is being sucked dry from the inside out by hideous, bronze-y Japanese beetles. Luckily the oregano, rosemary, summer savory, and chives (as well as the tomatoes and chilis) are just fine – plenty of flavor to carry us through the season – but the buggy (and batty!) infestation is a bit disgusting, sigh. 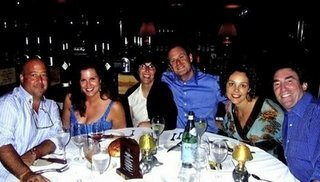 And oh, I DID get the scanned pic of our dinner at Morton’s with Andrew& Rishia Zimmern, and Carol & Aaron Mack, to celebrate Aaron’s birthday. We were very…BLUE that evening! Fun night, great to see everyone, and once again, Happy Birthday Aaron. Moderate it: thank goodness that just a little creme fraiche – one of the most delicious creations on Earth – goes a long way. Just a teaspoon to finish scrambled eggs, or a dab in a pan of sauteed veggies (above), or a smidge with fresh berries, makes a dish over-the-top delicious.